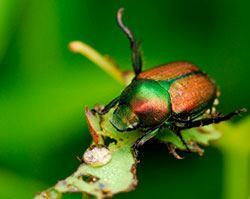 Controlling pests in garden is a big concern for beginner gardeners. Many inexperienced gardeners have very little tolerance of most insects. But more experienced gardeners know that it’s impossible – and not at all desirable – to have an insect-free garden. Unfortunately, the most troublesome pests have given all insects a bad rap, but experts say that only a small percentage are truly bad news. Most insects do little harm to plants and are essential as pollinators, consumers of pests and decomposing plant material, and vital as food for fish, birds and other wildlife. Fortunately for flower gardeners, most pests leave healthy plants alone and tend to zoom in on stressed plants. Poor gardening practices – for example, choosing plants not suited to your soil or garden conditions – can lead to stressed plants, which can lead to pest invasions. With evidence of increased pest resistance to chemicals, worries about environmental problems and growing public opposition to pesticide use, there’s more incentive than ever to care for our own gardens more naturally. When you need to spray, choose from the less toxic organic pest-control products now available. Most of them break down quickly and leave no residual toxic effects. Follow package directions, and spot-treat only the problem area to avoid killing beneficial insects. In most cases, the product has to actually hit the insects to be effective. Use dormant oil sprays in early spring to smother over-wintering pests on woody plants. Be sure to read instructions, as some plants should not be sprayed with dormant oil. Insecticidal soap destroys soft-bodied pests such as aphids, mites and whiteflies. To work for controlling pests, the spray must hit the insects. For bad infestations, spray every three days over a two-week period. Some plants are injured by insecticidal soap, so check label before using. Pyrethrin dusts or sprays, derived from flowers of pyrethrum daisies, attack insects’ central nervous systems, and break down quickly in air, light and heat. They are effective against many flying, chewing and sucking insect pests, but toxic to fish, so avoid using near ponds or streams. Bacillus thuringiensis, a naturally occurring bacterium, disrupts digestion in caterpillars and other leaf-eaters. Know the pest before buying this product – different strains of the bacterium are used for specific insects. One form Bt (Bti) is very effective for controlling mosquitoes in their larvae stage, preventing the adults from hatching.